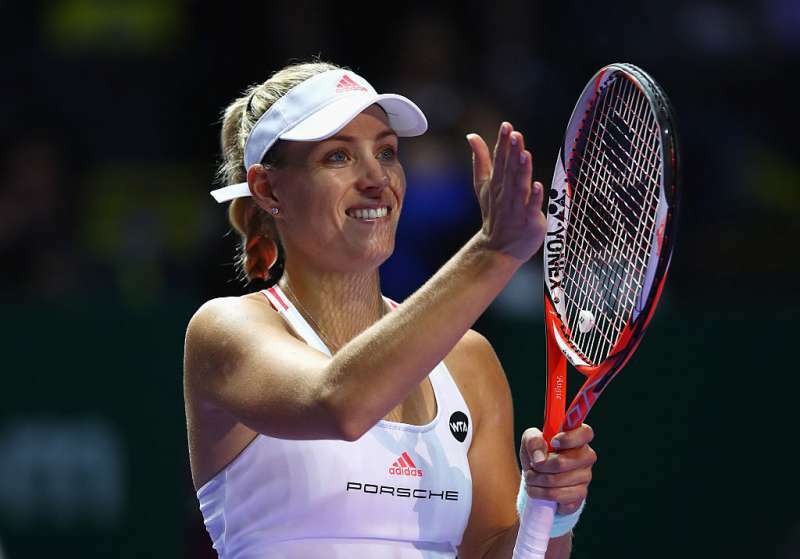 World No.1 Angelique Kerber and seventh seed Dominika Cibulkova booked their places in the semi-finals of the season-ending WTA Finals with spectacular performances in Singapore on Thursday. The Slovak, a debutante this time at the prestigious year-ender, had the faintest chance of making it through and all she needed was a straight-sets win over the third seed and 2014 runner-up Simona Halep. Cibulkova managed exactly that as she triumphed 6-3, 7-6(5) over the Romanian to keep her hopes alive. For Cibulkova to progress, she also needed a bit of assistance from the top seed Kerber. The only way in which she could make it through to the semis from the Red Group was if the German defeated debutante Madison Keys in straight sets. And for herself, Kerber only required a set to grab a semi-final berth. Kerber put up a display worthy of the best player in the world that she is and trumped the 21-year-old American, 6-3, 6-3. That not only sealed Cibulkova’s place in the last-four stage but it also meant that the two-time Grand Slam champion herself would top her group. 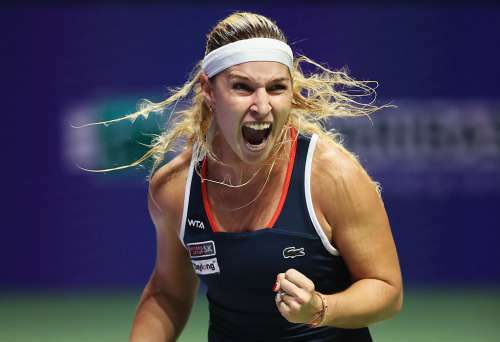 Unfazed by her two losses in this event, Cibulkova turned up for her match against Halep, knowing that she would have to be at her immaculate best to have any chance. The Slovak had never lost to Halep on hardcourts in their five previous showdowns. That surely boosted her confidence even further. The 2014 Australian Open runner-up fired as many as 32 winners in this 1-hour 48-minute contest. With just a solitary break of serve, she pocketed the opening set and denied any break point opportunity to Halep throughout the set. The second set turned out to be a breakfast with each player pounding ferocious returns. They traded three breaks of serves each until the set reached the tie-break. Even the breaker remained competitive where Cibulkova raised her level and took the last three points to win. The diminutive Slovak, later, on admitted she was very happy with the way she handled herself under tremendous pressure. Kerber came into this match having defeated the young Keys twice this year and that too, in straight sets. Needless, to say, the World No. 1 was prepared enough to defuse the barrage of attacking shots from the American. Kerber broke Keys in the latter’s opening service game but could not consolidate the break. However, the German soon regrouped and struck thrice more in the topsy-turvy set to clinch the opener, 6-3. The second set closely resembled the first one. There too, the southpaw went a breakdown but managed to steer her way out of trouble by breaking right back. The top seed remained the steadier player throughout the remainder of the set and marched to victory in 61 minutes. This is the first time that Kerber advanced to the semi-finals in four attempts. On Wednesday, Svetlana Kuznetsova made it through to the semis for the first time. The last semi-finalist will be decided on Friday when the defending champion Agnieszka Radwanska takes on the US Open runner-up Karolina Pliskova. The winner of that match progresses into the final four.